The Venezuelan people are facing a grave and dangerous situation, as the US dramatically escalates its campaign to oust Venezuela’s democratically elected government. Donald Trump’s decision on Wednesday January 23 to recognise the unelected right-wing opposition leader Juan Guaido as Venezuela’s “interim president” is confirmation that a co-ordinated operation led by the US to bring about regime change, which is illegal under international law, is under way. The White House is also considering the “nuclear option” of imposing sanctions on Venezuela’s crude oil which would have a devastating effect on the economy. It has been the policy of the US to remove Venezuela’s successive progressive governments since the first one was elected 20 years ago. Over the past two decades the US has poured millions of dollars into funding right-wing opposition groups in Venezuela and sponsored a failed coup in 2002 to remove Hugo Chavez, which was defeated by the Venezuelan people. Under Chavez Venezuela entered a new, independent era where the interests of the Venezuelan people were put before the interests of the US and oil multinational giants. Prior to Chavez’s election in 1998 Venezuela was dominated by US interests that saw the overwhelming majority of oil revenues go to multinational corporations at the expense of the population which languished in poverty, while the rest of the economy remained underdeveloped. Chavez’s decision to nationalise the oil industry and use its revenue to tackle poverty and improve living standards with huge health, education and housing programmes was intolerable to the US. Since 2014 the US has seized upon an “opportunity” to foment political instability in Venezuela and achieve its long-held aim of regime change by launching an offensive on the back of problems in Venezuela’s economy. The global economic crisis led to a crash in commodity prices in 2014 which saw the price of oil plummet, creating severe economic problems for Venezuela which the US has sought to ruthlessly exploit. From backing violent right-wing street mobilisations, to international initiatives designed to isolate Venezuela, to imposing wave upon wave of economic sanctions, which has cost the Venezuelan economy billions of dollars, the US has pursued a wide range of tactics to create the conditions for a coup. In the face of this intense campaign from the US, the Venezuelan people decided last year to continue on the path of national independence. 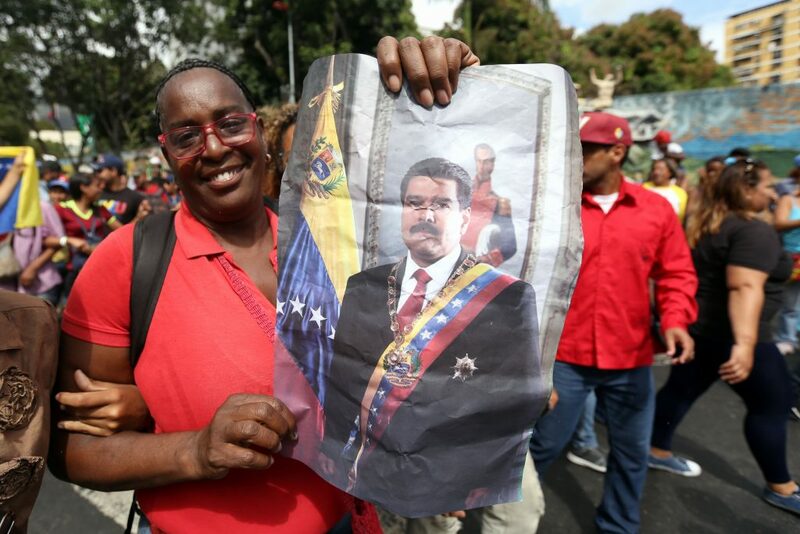 In the presidential election of May 2018 Nicolas Maduro of the United Socialist Party of Venezuela (PSUV) was re-elected with 68 per cent of the vote. Under the guidance of the US, some sections of the right-wing opposition in Venezuela boycotted this election because they knew that they could not win a majority in a free and fair contest. Instead of competing in the election and losing at the ballot box, an intense international campaign to delegitimise Venezuela’s democratic process was launched by the US, which announced that it would not recognise the election result weeks before the election actually took place. Contrary to pronouncements from US Vice-President Mike Pence that Maduro is a “dictator,” the reality is that Maduro is the constitutional, legitimate and democratically elected president of Venezuela despite the US’s aggressive attempts to blackmail the Venezuelan people. Trump’s brazen recognition of Guaido as the interim president of Venezuela, when he did not even participate in the presidential election, is an attempt to reverse the democratic will of the Venezuelan people. It represents a new stage in the US’s aggression against Venezuela and comes following a dramatic shift towards the right in Latin America over the past couple of years which has served to isolate the Maduro government from some Latin American governments. The election of fascist Jair Bolsonaro in Brazil’s presidential election of October 2018, after the left’s leading candidate Lula was banned from standing, represented a seismic shift in the regional balance of forces — a huge defeat for the left and a massive victory for the US, which has direct consequences for Venezuela as the events of the past week are confirming. Bolsonaro dutifully followed Trump’s lead in recognising Guaido as Venezuela’s president, alongside Colombia, Peru, Paraguay, Ecuador and Costa Rica. Nonetheless, the governments of Mexico, Bolivia, Cuba, Nicaragua, Uruguay and elsewhere are calling for dialogue rather than following Trump’s hostile agenda. The Venezuelan armed forces have refused to recognise Guaido as interim president and reaffirmed their commitment to defending the Venezuelan constitution. In addition to huge pro-government street protests in Venezuela, Maduro’s legitimacy has been confirmed by many major governments internationally including Russia, China and Turkey. The remaining threats that Trump has “on the table” should be taken seriously. Economic sanctions on Venezuela’s crude oil and military intervention are both being considered as tactics to achieve regime change in Venezuela. If Trump pursues either one of these options, the consequences for the Venezuelan people would be severe. The people of Venezuela need immense international solidarity in the face of US aggression, threats and violations of international law. It is up to the Venezuelan people to decide their future, not Donald Trump. Fiona Edwards is a member of the EC of the Venezuela Solidarity Campaign. You can join at www.venezuelasolidarity.co.uk and sign its new petition against regime change at vsc.eaction.org.uk/petition/nototrumponvenezuela.